My guess is you are already familiar with the metaphorical frog dropped into the metaphorically boiling water. But in case you are not, here it is: If you toss a frog into boiling water, he will jump right back out, but if you put him in a pot of comfortably temperate water and slowly turn up the heat, he will swim about never realizing the mortal danger he’s in – until its too late and he has become an ex-frog. 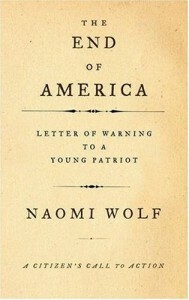 Naomi Wolf’s latest book, The End of America – A Letter of Warning to a Young Patriot – doesn’t directly employ the metaphor, but she does write of the amphibious tendencies of her fellow citizens. Though she will be accused by those on the political Right of being a hysterical looney – she is anything but. Her book is a tremendously sober and sobering historical analysis of how a number of free and open societies became closed and terrorized societies in relatively short periods of time. This book is written in the tradition of Thomas Paine’s Common Sense. It is intended to shake citizens awake to the very real changes that are occurring in their body politic, changes that can be traced and compared to the changes that occurred in Weimar Germany, pre-fascist Italy, Pinochet’s Chile, the Soviet Union and other countries over the past century. In studying societies that have closed, Wolf identifies ten changes that occur within these cultures and governments; and she notes that in the United States of America all ten of the changes are currently underway. Those changes include the invocation of an external and an internal threat, the development of a network of secret prisons, the surveillance of ordinary citizens, the infiltration of citizens’ groups, the restriction of the press, and the casting of political criticism as espionage and treason. If fascism does come to America (or again to Germany or Russia or Guatemala) it won’t look like a Leni Riefenstahl movie. It will be familiar, and to many in the society, comforting. But will we be able to truly call it America? Wolf asks us to consider if we can call it America right now. Would Thomas Jefferson countenance the torture of anyone, including Citizens of the Republic like Jose Padilla? Would Oliver Wendell Holmes turn his eyes from the development and expansion of a network of secret prisons that today hold mostly brown and distant men – but tomorrow could, if certain pundits and politicians had their way – hold neighbors with the courage to dissent from the policies of a government that claims to possess superior knowledge of the world we all share? Over the past decade we have allowed our leaders to create a climate of eternal threat – and to expect those same leaders to ratchet back their abuses is a fool’s errand. And fools, as frogs, might soon be cooked. Wolf’s central message is that we must awake to the true dangers posed by our complicity and surrender. We have been gifted a legacy of radical liberty, if we fail in its defense, we fail forever.